The basic outline is similar to the 1992 film. Deloris (Ashley Johnson) is the witness to a crime; her gangster boyfriend, Curtis (DeCarlo Raspberry), shoots a man who he thinks ‘squealed’ on him to the cops. Deloris runs to the police station and finds old high school mate ‘Sweaty Eddie’ (Hasani Allen) behind the desk. To save her, Eddie puts Deloris in a witness protection program – at a convent. Of course, this is the last place anyone would ever think Deloris would be hiding. All in all, the musical is just holy fun. Mother Superior (Lynn Sharp-Spears) declares that Deloris will be Sister Mary Clarence and introduces her to the other nuns. Of course, there’s plenty that goes wrong; Deloris has to lead the prayer at dinner and answer constant questions from perky Sister Mary Patrick (Amy Haynes). And she’s unable to resist temptation when she hears there’s a bar across the street (where Curtis and his men almost recognize her). When Deloris goes to choir practice the next day, she finds that the nuns are terrible and decides to lead the group. Under Deloris’s lead, the choir becomes a sensation and money starts pouring in to the struggling church (much to the chagrin of Mother Superior who questions modern music with a traditional choir). Unfortunately, this also means Curtis realizes where Deloris has been hiding after hearing her voice on the radio. When Curtis comes to get Deloris, it’s ‘Sweaty Eddie’ that saves the day. With a musical based on a choir of nuns, it’s all about the singing. Fortunately, “Sister Act” does not disappoint. When all the nuns sing together, it’s heavenly – including “Sunday Morning Fever” and “Spread the Love Around.” How can you not enjoy seeing a bunch of nuns transform from serious, terrible singers to fun-loving women just having a good time (in the name of God, of course)? I particularly liked “Bless Our Show,” when the nuns finally got out of their habits and into their PJs, showing off their dance moves on top of Deloris’s bed. Since the action takes place in Philly in the 1970s, the score has elements of disco and ‘70s soul. In “I Could Be That Guy,” Eddie lets us see the disco king behind that geeky persona. In “Lady in the Long Black Dress,” Curtis’s henchmen get a turn to shine as they sing about romancing the nuns (Russell Sunday as Joey, Moses Bernal as Pablo, Tobias Young as TJ). With lyrics like “see, I know what all your vows permit, and I don’t mind keepin’ it immaculate” and some goofy dance moves, these guys with no game keep the audience entertained. The show focuses on some great character moments. Sister Mary Robert (Teresa Danskey) is a young postulant finding her way in the world. In “The Life I Never Led,” she considers all the things she’s never done (like sleep late, rebel, or ask questions) and that she still might have the chance to experience them. Deloris (Johnson) is feisty and full of attitude, a good contrast to wry, restrained Mother Superior (Lynn Sharp-Spears). And Curtis (Raspberry) is the gangster we can’t help but despise, especially when he sings lines like “I’m going to kill that girl… and drill that girl” in “When I Find My Baby.” Um… not exactly the most loving boyfriend. 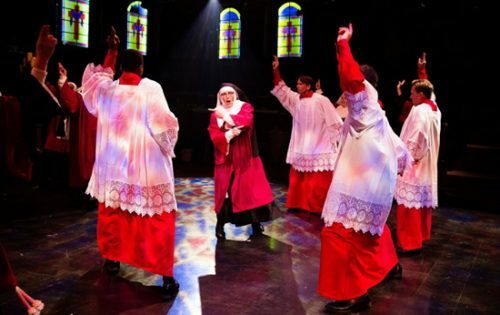 “Sister Act” explores a different side of spirituality and shows that “it’s good to be a nun.” Sure… you have to wake up at 4am, fast, and renounce all of your possessions, but that’s ok if you also have time to sing and dance with the sisters. All in all, the musical is just holy fun. Running Time: 2 hours and 45 minutes with a 15-minute intermission. “Sister Act” runs through November 13 at Toby’s Dinner Theatre in Columbia. For tickets, click here.